Mountain Province opened my childhood years to an insatiable quest for extreme adventures with nature. I remember that as a kid, I would set off to the mountains to climb big trees, sing with the birds, and my favorite, chase hidden waterfalls. Those were memories filled with thrill, joy, and excitement. Up to this day, I continue to explore waterfalls in Mountain Province. Yes, countless more remain to be known and documented. Fortunately, my years of off-beat travels has taken me to even the remotest and most unforgiving trails leading to these natural spectacles. I have learned so much in all those years. More importantly, chasing these wonders reconnected me with my inner being and purpose. Oh yeah, I fell in love to these waterfalls. Who knows? You might also. 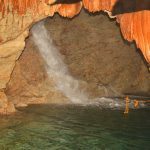 Now, I created the following list of particularly off-beaten waterfalls which you may visit this coming summer months. Take note: I personally visited and experienced most of these. 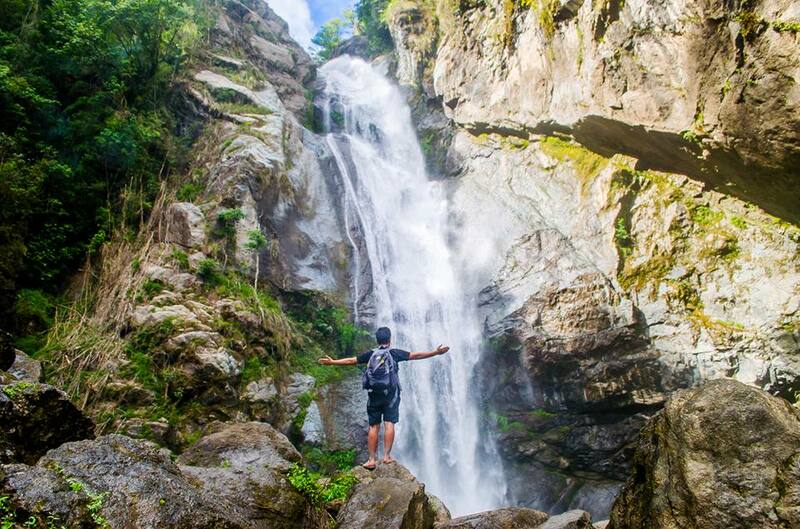 Nestled deep on the remote jungles of Barlig, Kafiliw Twin Falls is one of the least accessible waterfalls in Mountain Province. To get here, one needs to hike for at least five hours from the community proper. This entails trekking on hunter’s trails along dense forests and crossing the Tanudan River and its tributaries several times. The trail then continues on a brook leading to the falls. That takes more or less two hours. But this is the more challenging one as one needs to jump across boulders, wade on waist-deep pools, climb rocks, and hang unto vines. The difficulty in getting here, however, is eventually dissipated as one gazes on the falls’ breathtaking beauty. Like drizzles from the heavens, Kafiliw Falls exude caressing mists. When I first came here alone, I couldn’t help but shout in sheer amazement. The surrounding, tropical forests add beauty to the sight. It is a lost world indeed. The name certainly captures anybody’s curiosity. But it is one fitting description for the falls. Accordingly, one would feel like in paradise while within the falls’ vicinity. Paradise falls measures more than 30 meters high and consists of three layers. 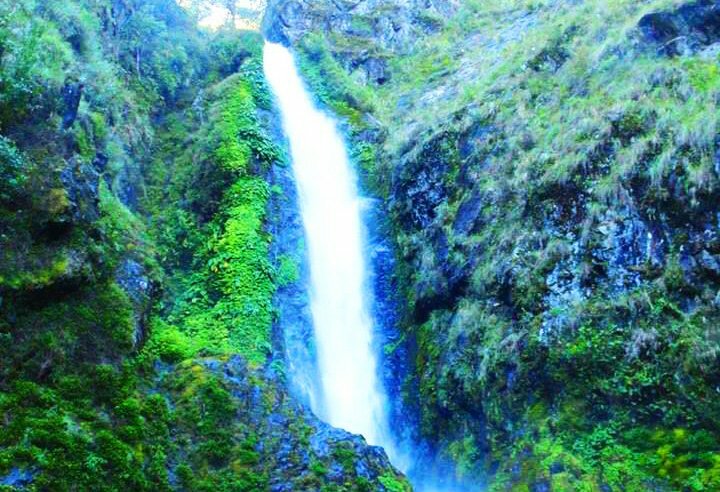 The third falls is the highest by far and cascades like a triangular bridal veil. Aside from the rejuvenating mists casted by the falls, the pine-scented atmosphere makes it worthwhile here. It is a perfect respite, away from the hustles and bustles of daily life. 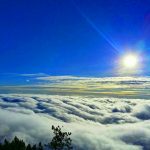 To get here, however, one needs to hike for more than two hours from the nearest barangay. Good thing, the path is well-established and the local authorities have been making improvements for convenience and safety purposes. 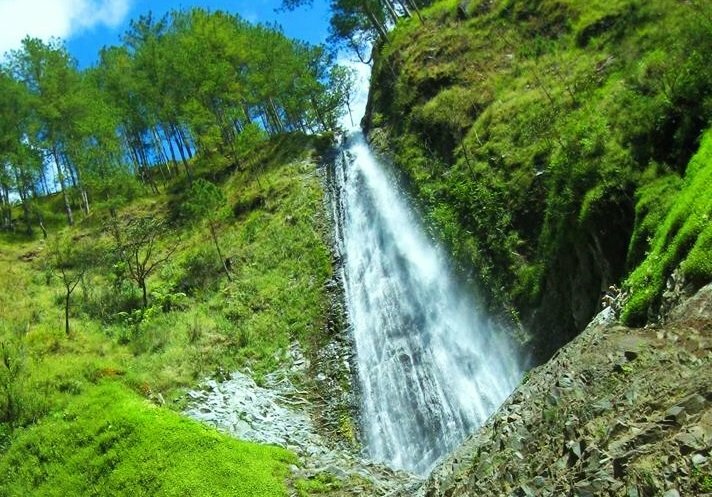 Pongas Falls is one of the several waterfalls found in Sagada. It is a twin-beauty measuring more than 40 meters high. It is best viewed during the rainy months as it turns into a roaring and complete beauty. Big boulders occupy the base of the falls though there are small pockets of pools. The best way, however, to enjoy the falls is to climb to its middle layer while letting the cascades massage your back. To reach Pongas falls, one needs to hike for more or less an hour from the nearest community. The trail passes along rice terraces and pine forests. There are steep parts of the trail, where one needs to hang unto rocks, to avoid slipping and breaking bones. The trek may seem long and winding but the panoramic mountain views provide constant relief. 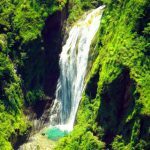 Bomod-ok falls is undeniably one of the most popular waterfalls in Mountain Province. 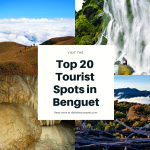 It is known as the Big Falls, being the highest in Sagada. It cascades for more than 50 meters towards a deep and wide pool. Beautiful rock formations surround the said pool, making cliff jumping/diving possible. Interestingly, the waters leading to the falls emanate from a cave. Perhaps, that explains why the fall’s water is crystal-clear and icy-cold. To get here, one needs to hike for more or less an hour from the road. The trail passes along the Fidelisan community and rice terraces. It is a downhill trek going to the falls and obviously, uphill going back. A guide is always required for every pax consisting of a maximum of five persons. That costs 500 pesos. 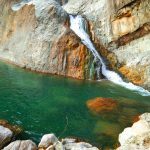 As per my experiences, it is best to visit Bomod-ok falls during the summer months. At these times, it is on its pristine blue condition. Besides, swimming here would be dangerous during the rainy months. Just like Bomod-ok falls in Sagada, Fuwaas falls is rising as one of the premium waterfalls in Mountain Province. It measures more than 75 meters high, making it the highest in Sadanga. Its pounding waters carved a very deep and wide pool. Until today, the actual measurement of the said pool is unknown. Giant eels are said to dwell here. In fact, one local caught an eel which weighed more than 15 kilos! 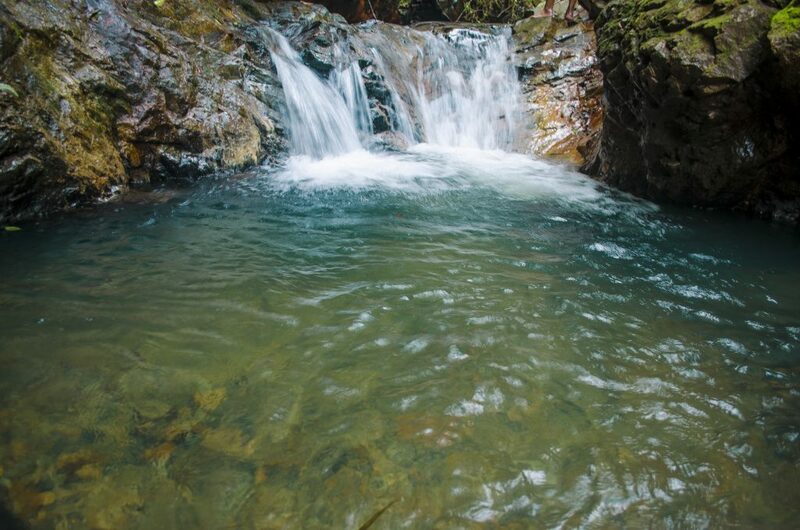 The waters of Fuwaas falls are also icy-cold and crystal-clear. 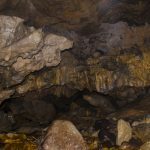 They emanate from Angoten Cave, another potential ecotourism spot in Belwang, Sadanga. 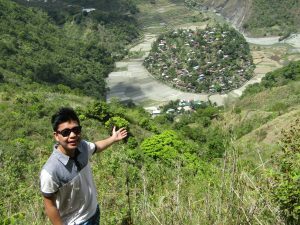 To get to the falls, one needs to hike for more or less an hour to reach Belwang community from Poblacion, Sadanga. From Belwang, one then hikes for more or less an hour before finally reaching Fuwaas falls. Fortunately, the long hike rewards one with spectacular views of Sadanga’s stone-walled rice terraces. Betwagan is one of the off-beaten communities in the province. 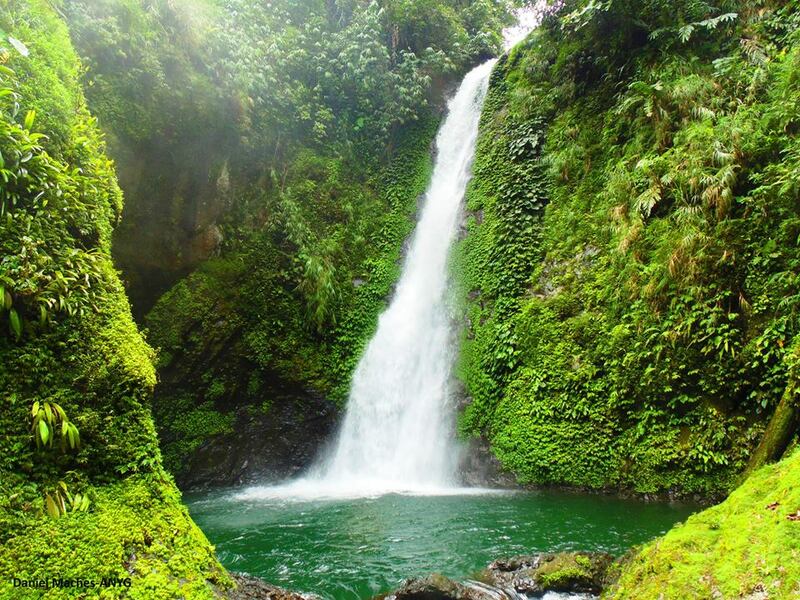 However, it boasts of hidden eco-wonders such as Akay-ay falls. I haven’t been to this falls yet. But one of my friends who personally visited it gave me a clear picture of how it looks like. In fact, I have included it on top of my bucket list. Accordingly, Akay-ay falls is multi-tier. Each layer has naturally-built and very deep pools. The highest of which is the second falls, cascading for more than 30 meters. If one follows the brook upstream, there is another twin falls. The brook feeding these falls come from the mossy forests of Barlig. 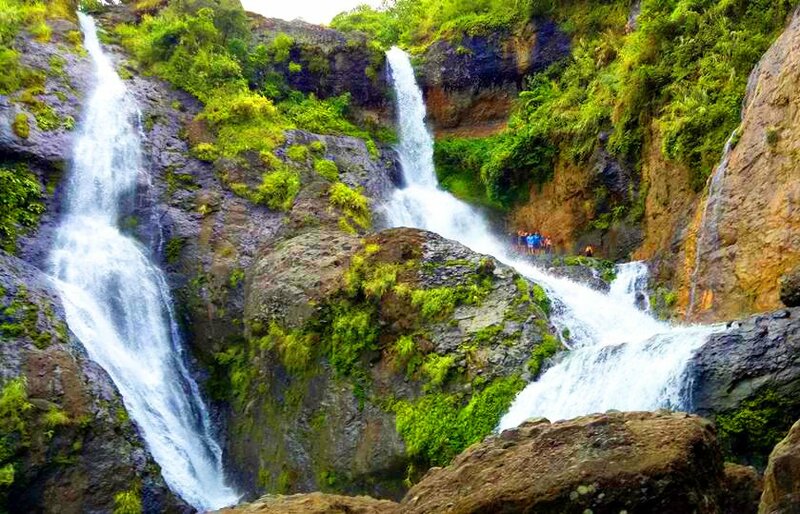 To reach Akay-ay falls, one must hike for more or less two hours from the community proper. 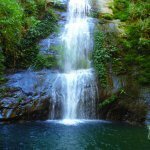 Wangcharlin falls is just one of the many wonders hidden amidst the rainforests of Barlig. 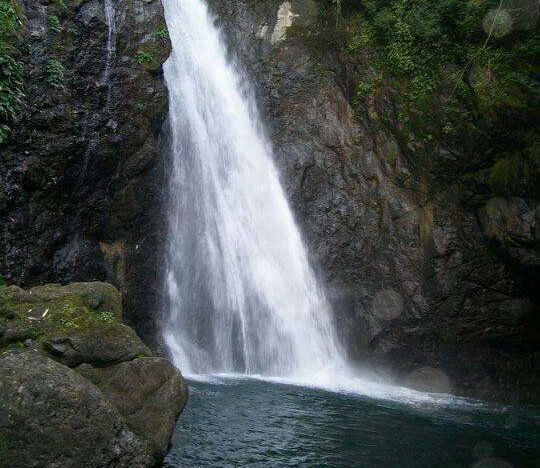 It is one of the waterfalls in Mountain Province that is at its utmost pristine condition. When I first came here, I could not help but bask myself like I was in paradise. Cascading like heavenly drizzles, Wangcharlin falls descends for more than 20 meters. It has a small and quite shallow pool. It is a perfect respite for those seeking complete nature immersions. To get there, however, expect to trek along rice terraces, irrigation canals, and later on dense forests. One then follows the brook leading to the falls. Because of these, I would only recommend the falls for extreme hikers and adventurers. 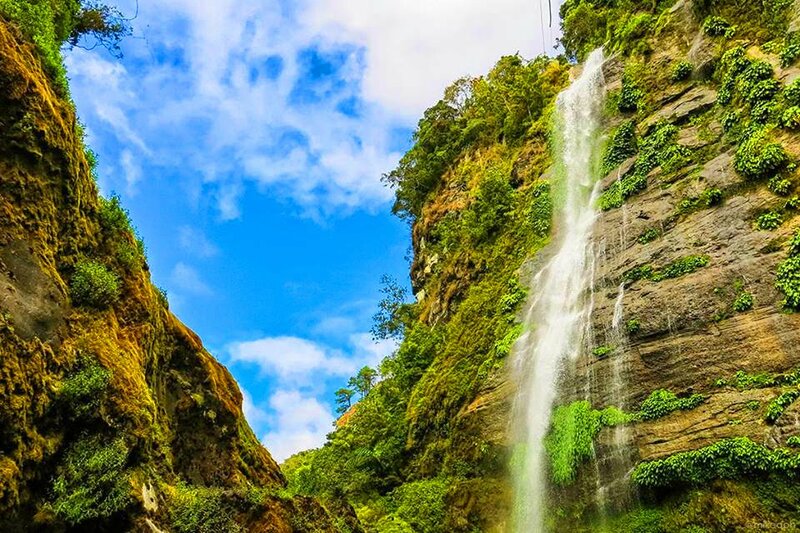 Considered as the tallest, single-drop cascade in Bontoc, Humuyyo falls is a beauty to behold. 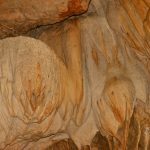 It has two layers which collectively, measure more than 40 meters high. 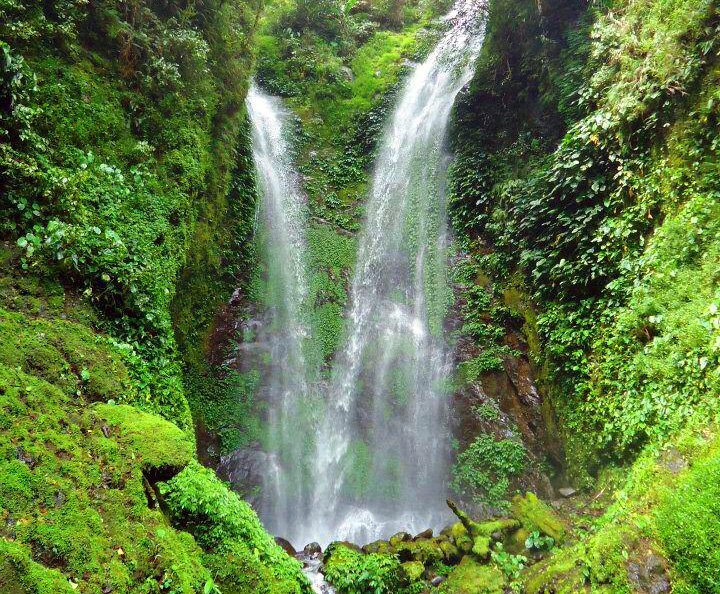 Humuyyo falls’ icy-cold and crystal clear waters emanate from mossy forests further upstream. 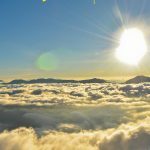 If properly developed, this could significantly boost ecotourism in the local area, given its proximity to Bontoc town. Getting here, however, is quite a challenge. From Talubin community, one must walk for more or less 30 minutes to reach the falls. The trail passes along irrigation dikes, a brook, and along steep precipice. To date, there is no established guiding system and rates. But before proceeding to the falls, always consult with the barangay officials for their recommendations. That is also a basic protocol when visiting indigenous communities. Surprised? 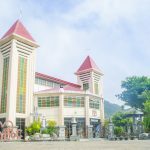 For all we know, Bontoc town is merely an educational and commercial hub. But not far away, there are eco-wonders worth seeing. Among these are the so-called Blue Lagoon Falls. 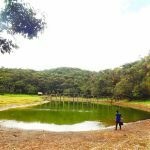 From what I’ve learned, this is a popular picnic site among college students and some locals and it is they who nicknamed it as Blue Lagoon. Well, it is such a fitting description. I went there and truth to be told, the waters are pristinely bluish! What surprises me is the fact that these are shallow and small pools and yet, the color pervades! By the way, the Blue Lagoon is actually a series of small falls. The highest of which is around 15 feet high. Based on my personal counts, there are at least five beautiful cascades. Further upstream, one can glimpse of tropical forests, among the few remaining in Bontoc. For more information about the Blue Lagoon, read this article. I’ve been to this falls once and I can boldly tell you, it was a surreal experience! Visiting Mapesak falls made me feel like time was standing still. 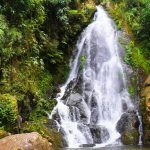 It is one of the least known waterfalls in Mountain Province. But it is one of the best I have ever seen. Mapesak falls is actually two-layered, however, only the first cascade is readily seen upon reaching the site. It measures more than 35 meters high and has a very deep and greenish pool. From the looks of it, a creature lurks underneath. But that is just my imagination. I could only stand there in awe and that was enough to caress me after the long trek of getting here. Yes, getting here is filled with extremities. It’s more than a day hike, passing along hunter’s trails across dense forests. At some point, there are no trails and one would need cut through thick undergrowth and foliage using a machete/bolo. 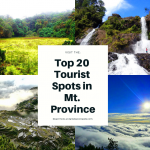 If you need further information that may help in setting up your itinerary to the waterfalls in Mountain Province, simply ask them on the comment section below. You can also message us on our facebook page namely, Daniel’s Eco-Travels. I will be more than glad and willing to answer them whenever I can. For more meaningful and responsible travels, I remain! 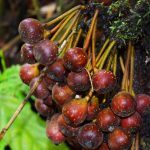 Help me improve this article! 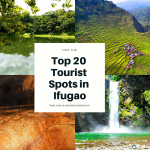 If you know of other waterfalls that can be included on this list, kindly write them down on the comment section below. Thank you very much!